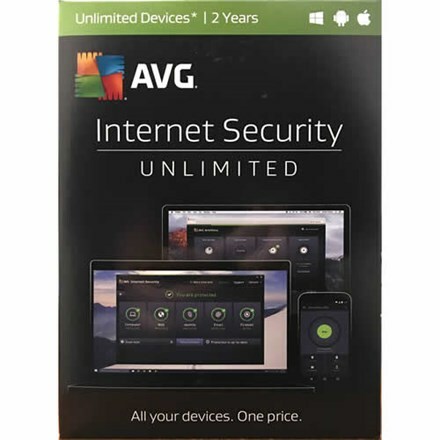 AVG Internet Security - Unlimited protects you both online and offline using machine learning, artificial intelligence to stop viruses, ransomware, spyware, and other malware in real-time. 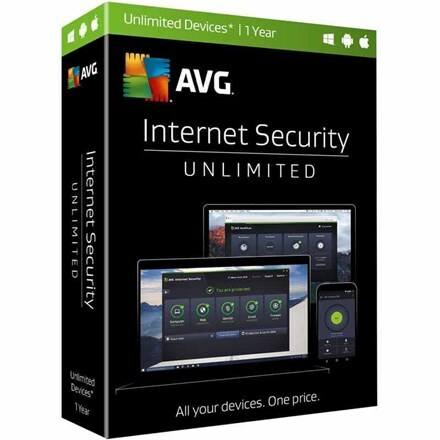 AVG is a worldwide best seller, one of the most popular online protection products in the world and it's used by millions daily. AVG PC protection - With real-time protection and advanced machine learning, we keep your computer free of viruses, spyware, ransomware, rootkits, Trojans, and other nasty malware. Our Enhanced Firewall also keeps hackers off your PC. Surf & email safer - Block unsafe links, downloads, spam, and email attachments keeping you safe. AVG makes sure you avoid fake copycat websites so you don't unintentionally give criminals your passwords, credit card numbers, or other personal info. AVG ransomware protection - 100% Protect personal photos, documents, and files from malicious encryption, and have total control over which apps can change or delete your files. Stop webcam spying - Keep peeping Toms out of your home - and children's bedrooms - by allowing only trusted apps to use your webcam and warns you when anything suspicious tries to access your camera. Stay up-to- date - Security updates, so you never need to manually update your AVG software to stay protected from the latest threats. Protect the whole family - Easily protect your whole family, no matter how many devices anyone has or what kind they are. Best of all, you can do all this from a single dashboard, from anywhere in the world. Shipping immediately vie email - You will be live within 5 minutes. AVG's brilliant Support available 24/7. GooD protection, good service from BeSecureOnline, Tony from support did a great job.